How Do We Revisit Memory? Cinema presents memory as a collective commodity, and as a means to tapping into the strength of human existence. It provides a platform for engaging history and questioning the past from the standpoint of the present. 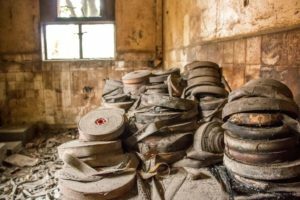 When a group of film enthusiasts one afternoon prepared for a screening at the Nigerian Film Corporation in Ikoyi, they accidentally came across a stash of forgotten film reels rotting away in a ‘ghost room’. The state of the reels, numbering hundreds, immediately brought up many questions: Could this encounter be a metaphor for how we engage memory as a people? Why have we never really consciously engaged with history? Is this negligence an oversight of a people or did we, as a nation, over the years, decide it unnecessary to engage the past? RECLAIMING HISTORY, UNVEILING MEMORY, a 2-Day symposium by Lagos Film Society (LFS), supported by Goethe-Institut Nigeria and British Council, seeks to fill this vacuum, to shine a flashlight, and make a floodlight of it, into the mystery that shrouds a collective past, and to trigger the culture of revisiting memory. On 29th and 30th April, 2016, local and international experts will be sharing the archival experiences with the interested audience via panels, presentations, film screenings, and workshops. The Indonesian film collective Lab Labalaba will present their approach to film archives in Jakarta, while London-based German film curator Nikolaus Perneczky (Filmkollektiv Frankfurt) will talk about working with African film archives in a European context. Beninois filmmaker, Idrissou Mora-Kpai, will present his film “Indochine”, and iconic Nigerian filmmaker, Dr. Ola Balogun, will screen and discuss some of his early films. There will also be a special session curated by Nsibidi Institute and the Royal African Society. The venue of the conference is the Nigerian Film Corporation, Ikoyi road, beside Voice of Nigeria, Ikoyi; the program starts on Friday, 29 April at 10am, on Saturday, 30 April at 11am. 10:45am Keynote address "The Spider and the Cellulloid Web"
2pm Panel discussion "Memories, History, and cinema"
3:45pm Keynote "Magic of Nigeria - On the cinema of Ola Balogun"
TIME-TRAVEL 101: WORKING CREATIVELY WITH FILM ARCHIVES A Workshop by Nsibidi Institute How do you make old footage come to life? What creative contributions can archival film provide to contemporary filmmaking? This 2 – 3 hour workshop serves as a informal introduction to the conceptual and creative process of incorporating archival footage into diverse works. Bringing together the experience of researchers and documentary filmmakers, it considers the business of working with archives: their material importance, accessibility to archival materials and copyright issues. Drawing from the personal experience of Dele Fatunla (Royal African Society), it offers a peek into the corridors of foreign institutions with archival footage of relevance to the Nigerian society, and the promising research and creative programmes such access could inspire. With the help of some exemplary screenings and filmmakers, the workshop provides a glimpse into the many different creative, technical and critical approaches to working with archival footage. Using standard creative filmmaking tools such as scriptwriting and story-boarding, it will engage participants in creative, interactive exercises that explore ways of applying different approaches to contemporary filmmaking and video art production. This workshop is open to filmmakers, scriptwriters, historians and others interested in filmmaking processes and exploring creative approaches to working with film archives. To register, please send your name and contact details to info@nsibidiinstitute.org by 2pm on Friday 29th May, 2016.